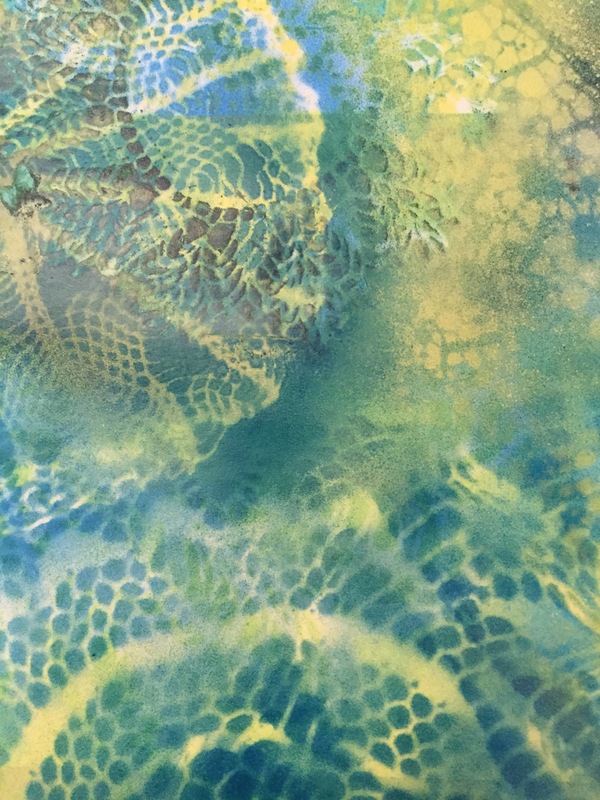 Every so often, I receive a confirming sign from the universe that I am on the right track with the themes and techniques I am exploring, and that everything is coming together to help me create meaningful pieces of art. Last week, I was grateful to receive one of these signs in the form of a meaningful gift from a friend with whom I am serving on a task force for a special exhibit focused on the fiber arts. 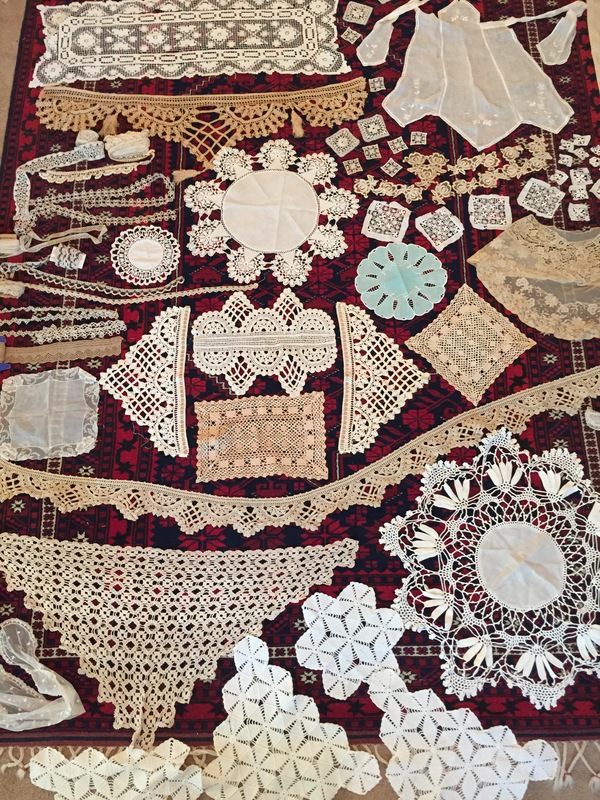 Those of you who know me are aware that I tend to be inspired by antique textiles in general, but this windfall really struck me because of the unusual designs and the quality and quantity of the handmade lace—there are yards of it! There is no way of knowing how many hours went into all of these gorgeous and complex pieces, but this collection definitely represents several hundred hours’ worth of work. Seeing the physical evidence of so much female talent and time spread out on my studio floor, waiting for me to repurpose and combine it with textiles from other cultures into my “collaborative” paintings, was humbling and actually moved me to tears. I felt as if the women who poured their hearts into making these lovely things had given me a special opportunity to highlight what they represent: not only beauty, but intelligence, patience and complexity! The timing of this gift of lace feels all the more meaningful because I have recently been making lots of paintings that incorporate both hand-painted pieces of lace and painted images of it. 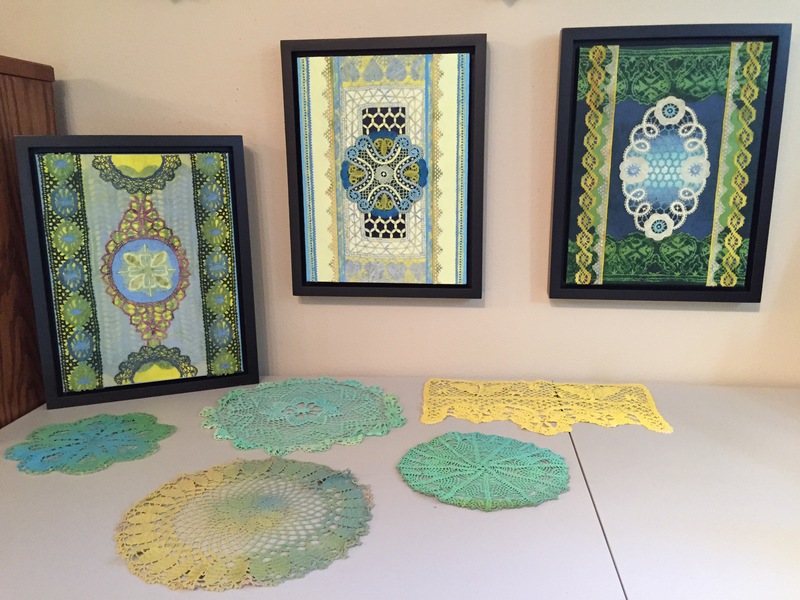 Three recently completed “Lace Studies” on canvas resonate with the theme of my “Trompe l’oeil: Homage to Needlework” series. 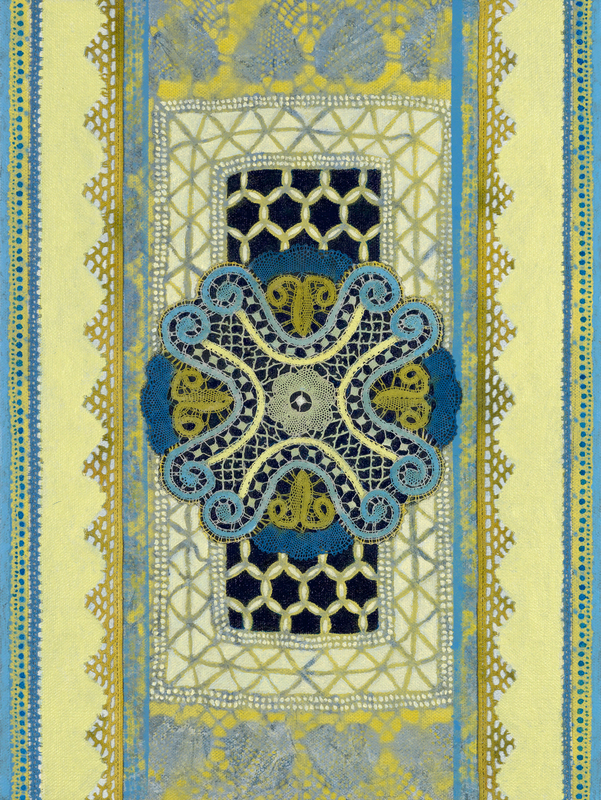 In these paintings, the question becomes, what is lace, and what is a painting of lace? 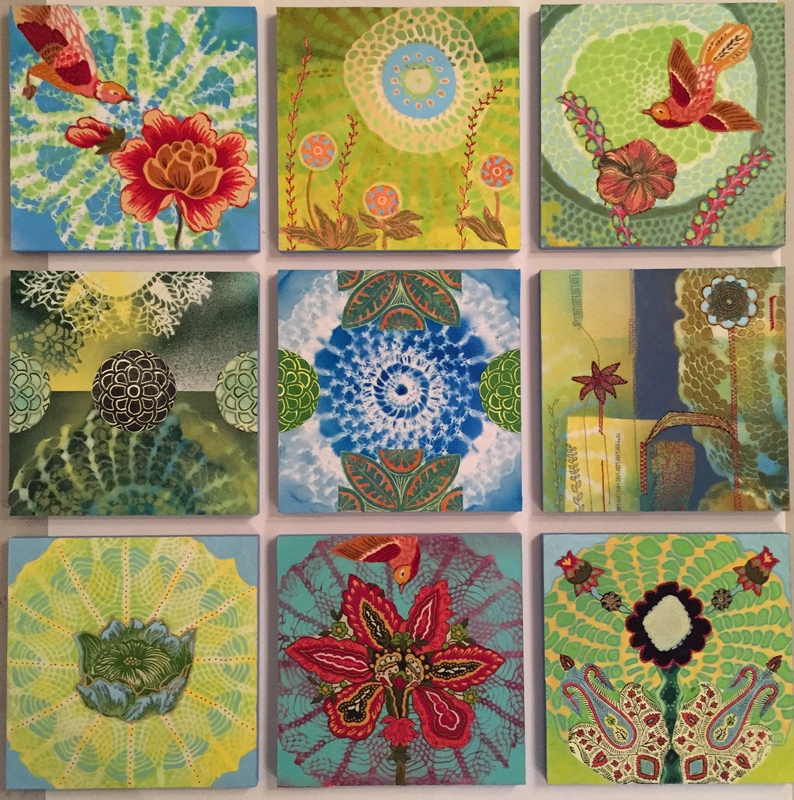 With the help of Liquitex’s new line of spray paints, which I began experimenting with this summer, I have been inspired to use doilies and lace as stencils to a much greater extent. When I used doilies as stencils in the past, I was always frustrated by the blurry images that were created by sponging paint through their holes; the spray paints yield much crisper, more detailed imagery, and this line of paint is archival, so I am not worried about it eating away at my collaged fabrics. I also experimented with lace for the “Big 500″ exhibit that is opening in Portland this weekend, featuring 500 Portland-area artists; the show’s only constraint is that the artwork be created on 8” square wood panels provided by the show. My pieces are small acrylic paintings on paper that have been stenciled, stitched and collaged before being adhered to the wood.